CSP plants of this type are designed for combined production of electrical and thermal energy. Parabolic concentrator with mirror surface reflects solar radiation to the focal point where is the PCU - power conversion unit (aggregate). 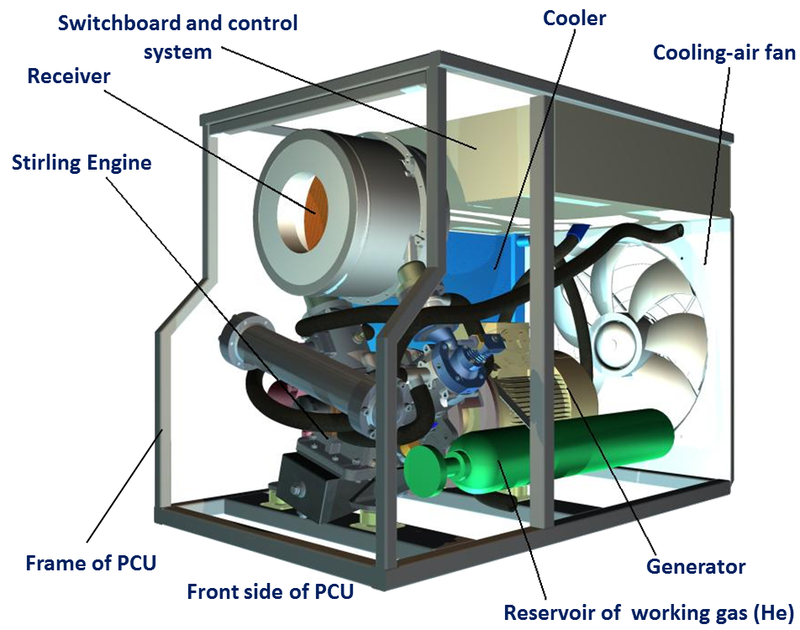 A main part of the PCU is Stirling engine which converts thermal energy gained from solar radiation to mechanical energy and then to the electrical energy via generator. This system also allows effective take-off of unused thermal energy and waste heat, so that the solar power plant can be used even for making heat and cold. This system features fully automatic controlling and positioning of the concentrator in two axis and meets the requirements in order to be built and engaged in harsh conditions. The output electricity can be sold or used for immediate consumption. 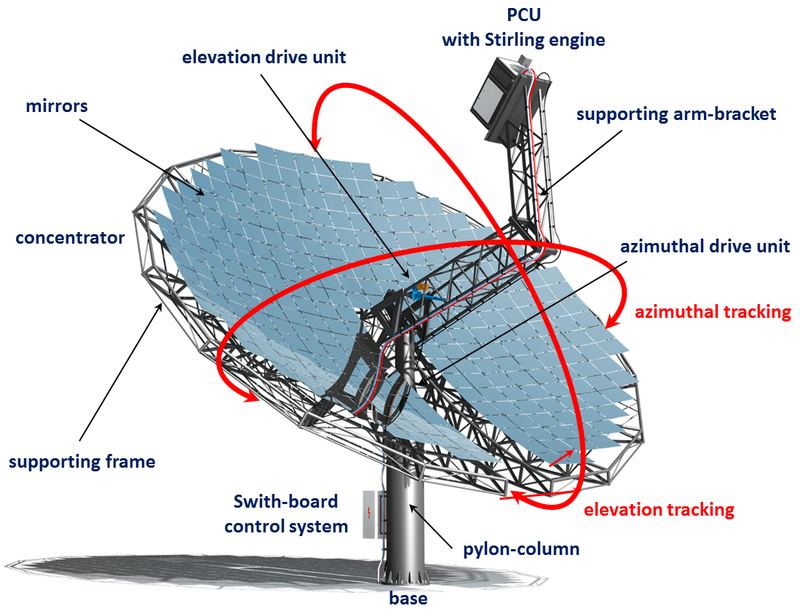 Solar concentrator is a primary solar component of Dish Stirling technology. Prefabricated steel zinc coated parabolic concentrator delivers the sun’s fuel into the focal point where PCU with Stirling engine’s receiver is placed. The concentrator’s area is 57m2. The parabolic concentrator reflects the incoming solar radiation (DNI) through glass mirrors onto a cavity receiver which is located at the concentrator’s focal point. Special proved silver coating glass mirrors reflect more than 94% of the sunlight and mirrors can be easy cleaned. The reflective solar radiation is absorbed by the heat exchanger receiver and thus heats the engine’s working gas Helium. In order to keep constantly the reflected radiation into the focal point during the day, double sun-tracking systems aim the solar concentrator continuously in two axes direct into the sun. Time-proven durable slew-drive units for azimuthal and elevation tracking system with high accuracy and reliability guarantee long-term operating in harsh conditions. The correct orientation direct into the sun is determined by special algorithm in control system. Control system ensures automatic turning of the concentrator into stow or safety parking position during achieving maximum allowable wind velocity. The heat power output of the concentrator is proportional to the concentrator’s area, current direct normal solar irradiation, precision of aiming, physical and optical mirror’s parameters and all losses. Area below the concentrator can be used for agriculture or pasture or other purposes. PCU 35 called aggregate includes the Stirling engine with generator and an external heat exchanger – receiver. The thermal receiver is a set of thin tubes with a working gas (Helium). The thermal receiver is the interface for heat transfer from concentrating reflected radiation from solar concentrator (dish) into the hot upper side of Stirling engine. The receiver which is placed on a cavity of PCU absorbs the incoming concentrated thermal energy (700°C – 800°C). Absorbed heat energy in working gas (~650°C) is transferred into mechanical energy in expansion cylinder. Installed crank drive provides rotating driving moment (1500 RPM) for generator which generates clean electricity (400 V, 50Hz, 3 phases). Maximum operating RPM are 1800 RPM (60 Hz). The cooling of the PCU and Stirling engine is managed by a closed loop cooling system with blower and radiators and therefore no water is consumed during common operation. Cooling liquid temperature at engine input is 45°C (antifreeze fluid). Water is used only for cleaning purposes of the concentrator’s mirrors and therefore the water consumption is extremely low compared to other CST, ST and CSP technologies. The remaining integral parts of aggregate are control system and switchboard with measurement and regulation system, auxiliary pressure vessel with Helium and heat resistant ceramic protective shield. The quality of production and assembly processes and their continuous quality control are fundamental for all parts of PCU and Stirling engine. Quality assessment is a permanent process, which is being continuously developed and improved in compliance with European Standards (EN ISO 9001, EN ISO 14001, EN ISO 3834, etc.). 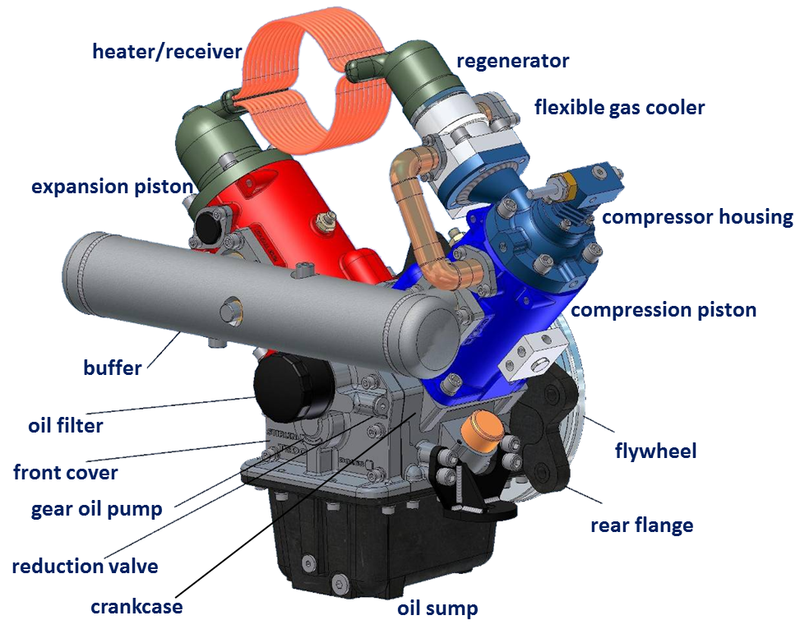 The heat Stirling engine (SB-Tedom V-183) is the most efficient thermodynamic cycle and it is a crucial device which converts heat energy into mechanical energy like combustion engines. Our Stirling engine is designed as a single-action α modification with closed-cycle double-cylinder reciprocating engine. The work cycle occurs only on one side of the pistons. This is quite a simple design that brings an acceptable production cost. The engine's displacement is 183 cm3. Electrical output is 2 - 10kWe with measured engine efficiency 15% - 25%. Optional thermal output is 9 - 25kWh. The gaseous working fluid is the inert gas Helium and maximum mean pressure is 15 MPa. During following years we are expecting further significant improving of operating and output parameters as well as economic benefits. A complete crankshaft mechanism with a crosshead and a piston rod is used to transfer the piston power. The crank case is designed as a non-pressurized unit. The crossheads transfer the normal forces and the pistons transfer the axial forces, which are necessary for the movement of the pistons with no lubrication. Only the lower part of the crankshaft mechanism is pressure-lubricated. The front cover houses an integrated gear pump, a reduction valve, a full-flow oil filter, and an oil cooler for the pressure-lubrication. Only 2 litres of oil are needed. Almost all components are made of standard materials such as modular iron or steel. Great attention was dedicated to cylinder cooling equality for control heat deformations. Expensive refractory and heat resistant materials are only used on the hot side of the engine where necessary, where a combination of high thermal and mechanical loads occurs. The robust design of the crank case lowers the mechanical noise of the machine. The output of the engine is regulated via changes in the pressure of working gas. A compressor is used to control pressure level. The compressor piston is activated via an electromagnetic valve. A buffer increases the pressure after opening the electromagnetic valve. The cooler of the gaseous working fluid is designed as tubular so that the thermal expansion of the heater head can be compensated for increasing its lifetime through start-stop cycles.